This evening I decided to crack out the acetone and scouring pad, lose the skin on my finger tips, and make my abused white diabolos a little cleaner again. Funny how slowly the dirt builds up. Just 3 months ago my diabolos were perfectly clean and I have rarely used them outside. I was thinking that my diabolos were looking just a little grey - a few marks here and there - boy was I wrong. Got me thinking that it might be fun to have a dirty diabolo contest (especially after seeing at the WJF that Priam has just cleaned his orange diabolos and is out of the running ). No need to clean your diabolos for the photo, I just thought the difference was stunning. If you need a free image host try ImageShack. Nice one Sean. Did you take my tip on the acetone and scouring pads? Priam and I cleaned ours before WJF. He was pretty surprised, I thought, at how clean his got. I'm glad mine are clean again, but they're going to get dirty quick once I start practicing 3 high outside again. I find I do better with clean props sometimes. Focuses my mind and makes me feel like a bit of a pro. Many Thanks to Sean for all his work and inspiration. Respect to the MFP! I've just cleaned my diabolo, but it was no way near being as dirty as that. Practicing with 2 differently coloured diabolos dirties them up pretty quickly. I used a plastic ruler and a duster to clean mine, and it worked really well. I've never used acetone or a scouring pad. Doesn't the metal damage the surface of it? Now, THOSE are some really dirty diabolos! But, the difference from white and ermm.. black (dirty-white), is much bigger than (for example) blue and dirty-blue. i dont think i have a picture of my diabolos when they were dirty. But they were as bad (perhaps worse) than Seans. Yellow/orange compared to dirty yellow/orange is a pretty big change. I cleaned mine the day before i left for Vegas, so they were pretty clean when i got there. I'll take a pic just before i clean them next time (and then an after shot aswell) that will probably be late March, they should be fairly dirty by then. Lucas's diabolos where literally black (with a red rim) at EJC, that was funny. I have a circus in glow but I always feel really reluctant to use it cos it obviously wont glow when it gets dirty!!! Its more of an ornament at the moment! Mine weren't that dirty really, but this is the first time I washed them since I got them. How mad would a wood chuck get if a big neon pink Koala bear named Ishtar ran into the woods and chucked all the wood before the woodchuck could chuck the wood? They were allready clean Static. The second pic shows the matt look that freaked me out the first time I cleaned mine. I've just washed my 3 Henry's Circus. They feel different now, it's weird. I'm sure the white one was never that white, either! yeah when i cleaned my orange one i swear it came out a lot more orange than when i bought it. 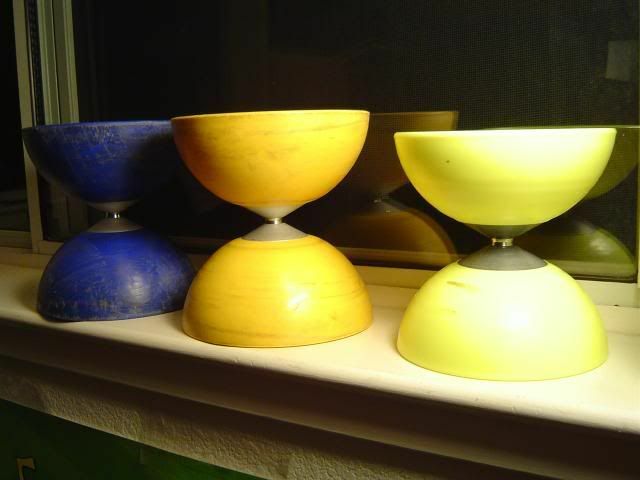 here are my diabolos (blue circus, yellow beach), and my friend Chris' diabolo (yellow circus) in the middle... all Henry's if you're wondering. the Beach is pretty clean except for one smudge where it hit my PS2 controller (havent really used it outside my room yet). i havent cleaned them since i got them, which isnt a big deal since i've only had the blue one for a few months and the yellow Beach since christmas. Mine cleaned up well with baking soda. Make kind of a paste with baking soda and a little water, then scrub away with a sponge. Still takes plenty of elbow grease, but maybe a bit more mild than the brillo&acetone combo. 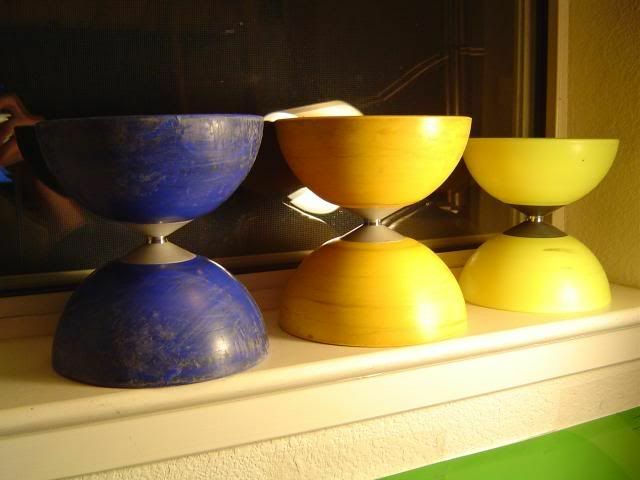 The diabolo wiki please contribute in any way you can. Yeah, they're amazing for that. Mine will be in their teens soon. It's impressive that they still seem to be going strong - they probably get smaller each time I wash them, and they continue to mark each other as well. My name is vinß, I'm french (from Bordeaux) and it's my first message on this forum. 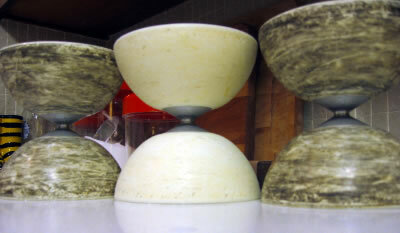 Wow, are you sure those arent white marks on a black diabolo!!!! Welcome to the forum, Vinß, great to have you here! I assume you have trained with diabolos for MANY hours by the dirt on your diabolos. It looks like you could use a little more dirt on the diabolo on the right. Get working on it!